(Trent Nelson | The Salt Lake Tribune) Oregon Ducks forward Kenny Wooten (14) flies over Utah Utes center Jayce Johnson (34) as the Utah Utes host the Oregon Ducks, NCAA basketball in Salt Lake City on Thursday Jan. 31, 2019. (Trent Nelson | The Salt Lake Tribune) Utah Utes center Jayce Johnson (34) shoots as the Utah Utes host the Oregon Ducks, NCAA basketball in Salt Lake City on Thursday Jan. 31, 2019. (Trent Nelson | The Salt Lake Tribune) Utah Utes center Jayce Johnson (34) dunks, defended by Oregon Ducks forward Paul White (13) as the Utah Utes host the Oregon Ducks, NCAA basketball in Salt Lake City on Thursday Jan. 31, 2019. (Trent Nelson | The Salt Lake Tribune) Utah Utes guard Sedrick Barefield (2) goes up for a shot defended by Oregon Ducks forward Louis King (2) and Oregon Ducks forward Kenny Wooten (14) as the Utah Utes host the Oregon Ducks, NCAA basketball in Salt Lake City on Thursday Jan. 31, 2019. (Trent Nelson | The Salt Lake Tribune) Utah Utes guard Sedrick Barefield (2) is fouled by Oregon Ducks forward Kenny Wooten (14) as the Utah Utes host the Oregon Ducks, NCAA basketball in Salt Lake City on Thursday Jan. 31, 2019. (Trent Nelson | The Salt Lake Tribune) Utah Utes guard Sedrick Barefield (2) is fouled by Oregon Ducks forward Kenny Wooten (14) as the Utah Utes host the Oregon Ducks, NCAA basketball in Salt Lake City on Thursday Jan. 31, 2019. (Trent Nelson | The Salt Lake Tribune) Utah Utes forward Timmy Allen (20) dunks as the Utah Utes host the Oregon Ducks, NCAA basketball in Salt Lake City on Thursday Jan. 31, 2019. (Trent Nelson | The Salt Lake Tribune) Utah Utes guard Sedrick Barefield (2) is fouled by Oregon Ducks forward Kenny Wooten (14) as the Utah Utes host the Oregon Ducks, NCAA basketball in Salt Lake City on Thursday Jan. 31, 2019. (Trent Nelson | The Salt Lake Tribune) Utah Utes guard Parker Van Dyke (5) drives on Oregon Ducks guard Payton Pritchard (3) as the Utah Utes host the Oregon Ducks, NCAA basketball in Salt Lake City on Thursday Jan. 31, 2019. (Trent Nelson | The Salt Lake Tribune) Utah Utes center Jayce Johnson (34) dunks, defended by Oregon Ducks forward Paul White (13) as the Utah Utes host the Oregon Ducks, NCAA basketball in Salt Lake City on Thursday Jan. 31, 2019. (Trent Nelson | The Salt Lake Tribune) Utah Utes guard Sedrick Barefield (2) defended by Oregon Ducks guard Payton Pritchard (3) as the Utah Utes host the Oregon Ducks, NCAA basketball in Salt Lake City on Thursday Jan. 31, 2019. (Trent Nelson | The Salt Lake Tribune) Utah Utes forward Timmy Allen (20) shoots, defended by Oregon Ducks guard Will Richardson (0) and Oregon Ducks forward Kenny Wooten (14) as the Utah Utes host the Oregon Ducks, NCAA basketball in Salt Lake City on Thursday Jan. 31, 2019. (Trent Nelson | The Salt Lake Tribune) Utah Utes guard Sedrick Barefield (2) as the Utah Utes host the Oregon Ducks, NCAA basketball in Salt Lake City on Thursday Jan. 31, 2019. (Trent Nelson | The Salt Lake Tribune) Utah Utes center Jayce Johnson (34) shoots over Oregon Ducks forward Francis Okoro (33) as the Utah Utes host the Oregon Ducks, NCAA basketball in Salt Lake City on Thursday Jan. 31, 2019. (Trent Nelson | The Salt Lake Tribune) Oregon Ducks guard Ehab Amin (4) reaches for a loose ball with Utah Utes forward Both Gach (11) at right, as the Utah Utes host the Oregon Ducks, NCAA basketball in Salt Lake City on Thursday Jan. 31, 2019. (Trent Nelson | The Salt Lake Tribune) Utah Utes guard Parker Van Dyke (5) looks to pass as the Utah Utes host the Oregon Ducks, NCAA basketball in Salt Lake City on Thursday Jan. 31, 2019. (Trent Nelson | The Salt Lake Tribune) Utah Utes forward Riley Battin (21) shoots a three-pointer as the Utah Utes host the Oregon Ducks, NCAA basketball in Salt Lake City on Thursday Jan. 31, 2019. (Trent Nelson | The Salt Lake Tribune) Utah Utes guard Parker Van Dyke (5) defended by Oregon Ducks guard Payton Pritchard (3) as the Utah Utes host the Oregon Ducks, NCAA basketball in Salt Lake City on Thursday Jan. 31, 2019. (Trent Nelson | The Salt Lake Tribune) Utah Utes forward Timmy Allen (20) shoots, defended by Oregon Ducks guard Will Richardson (0) and Oregon Ducks forward Kenny Wooten (14) as the Utah Utes host the Oregon Ducks, NCAA basketball in Salt Lake City on Thursday Jan. 31, 2019. (Trent Nelson | The Salt Lake Tribune) Utah Utes center Jayce Johnson (34) defended by Oregon Ducks guard Payton Pritchard (3) as the Utah Utes host the Oregon Ducks, NCAA basketball in Salt Lake City on Thursday Jan. 31, 2019. (Trent Nelson | The Salt Lake Tribune) Utah Utes forward Timmy Allen (20) defended by Oregon Ducks forward Francis Okoro (33) as the Utah Utes host the Oregon Ducks, NCAA basketball in Salt Lake City on Thursday Jan. 31, 2019. (Trent Nelson | The Salt Lake Tribune) Utah Utes forward Timmy Allen (20) looks to shoot as the Utah Utes host the Oregon Ducks, NCAA basketball in Salt Lake City on Thursday Jan. 31, 2019. (Trent Nelson | The Salt Lake Tribune) Oregon Ducks forward Kenny Wooten (14) flies over Utah Utes center Jayce Johnson (34) as the Utah Utes host the Oregon Ducks, NCAA basketball in Salt Lake City on Thursday Jan. 31, 2019. (Trent Nelson | The Salt Lake Tribune) Utah Utes forward Both Gach (11) passes as the Utah Utes host the Oregon Ducks, NCAA basketball in Salt Lake City on Thursday Jan. 31, 2019. (Trent Nelson | The Salt Lake Tribune) Utah fans react to a fall by Oregon Ducks forward Kenny Wooten (14) as the Utah Utes host the Oregon Ducks, NCAA basketball in Salt Lake City on Thursday Jan. 31, 2019. (Trent Nelson | The Salt Lake Tribune) Utah Utes center Jayce Johnson (34) dunks, defended by Oregon Ducks forward Paul White (13) as the Utah Utes host the Oregon Ducks, NCAA basketball in Salt Lake City on Thursday Jan. 31, 2019. (Trent Nelson | The Salt Lake Tribune) Utah coach Larry Krystkowiak as the Utah Utes host the Oregon Ducks, NCAA basketball in Salt Lake City on Thursday Jan. 31, 2019. (Trent Nelson | The Salt Lake Tribune) Oregon Ducks forward Paul White (13) shoots as the Utah Utes host the Oregon Ducks, NCAA basketball in Salt Lake City on Thursday Jan. 31, 2019. (Trent Nelson | The Salt Lake Tribune) Utah Utes guard Parker Van Dyke (5) blocks a shot by Oregon Ducks guard Will Richardson (0) as the Utah Utes host the Oregon Ducks, NCAA basketball in Salt Lake City on Thursday Jan. 31, 2019. (Trent Nelson | The Salt Lake Tribune) Utah players look on from the bench in the final moments of the loss, as the Utah Utes host the Oregon Ducks, NCAA basketball in Salt Lake City on Thursday Jan. 31, 2019. 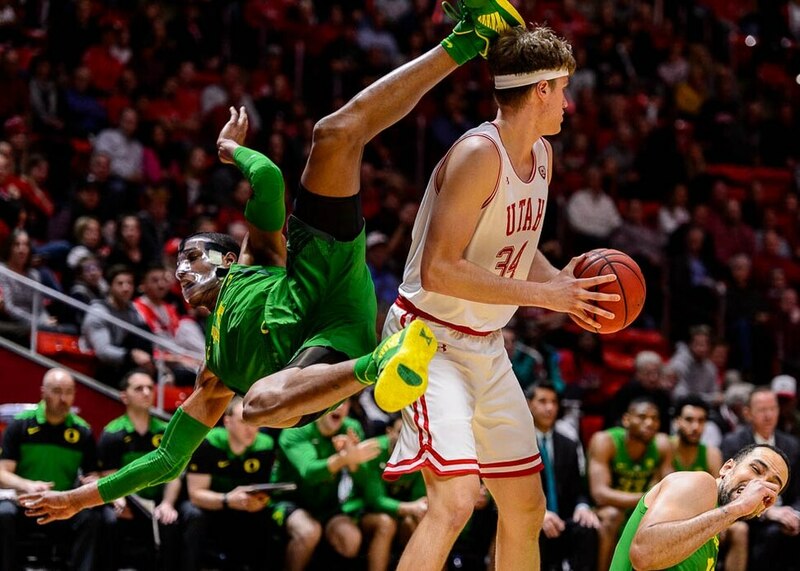 (Trent Nelson | The Salt Lake Tribune) Oregon Ducks guard Ehab Amin (4) steals a pass intended for Utah Utes guard Charles Jones Jr (1) as the Utah Utes host the Oregon Ducks, NCAA basketball in Salt Lake City on Thursday Jan. 31, 2019. (Trent Nelson | The Salt Lake Tribune) Oregon Ducks guard Ehab Amin (4) celebrates a turnover by Utah Utes forward Timmy Allen (20) as the Utah Utes host the Oregon Ducks, NCAA basketball in Salt Lake City on Thursday Jan. 31, 2019. (Trent Nelson | The Salt Lake Tribune) Oregon Ducks guard Ehab Amin (4) celebrates a turnover by Utah Utes forward Timmy Allen (20) as the Utah Utes host the Oregon Ducks, NCAA basketball in Salt Lake City on Thursday Jan. 31, 2019. (Trent Nelson | The Salt Lake Tribune) Utah coach Larry Krystkowiak as the Utah Utes host the Oregon Ducks, NCAA basketball in Salt Lake City on Thursday Jan. 31, 2019. (Trent Nelson | The Salt Lake Tribune) Utah Utes forward Timmy Allen (20) is pressured into a turnover by Oregon Ducks guard Ehab Amin (4) and Oregon Ducks guard Will Richardson (0) as the Utah Utes host the Oregon Ducks, NCAA basketball in Salt Lake City on Thursday Jan. 31, 2019. Utah’s throwback basketball game became a throwaway. 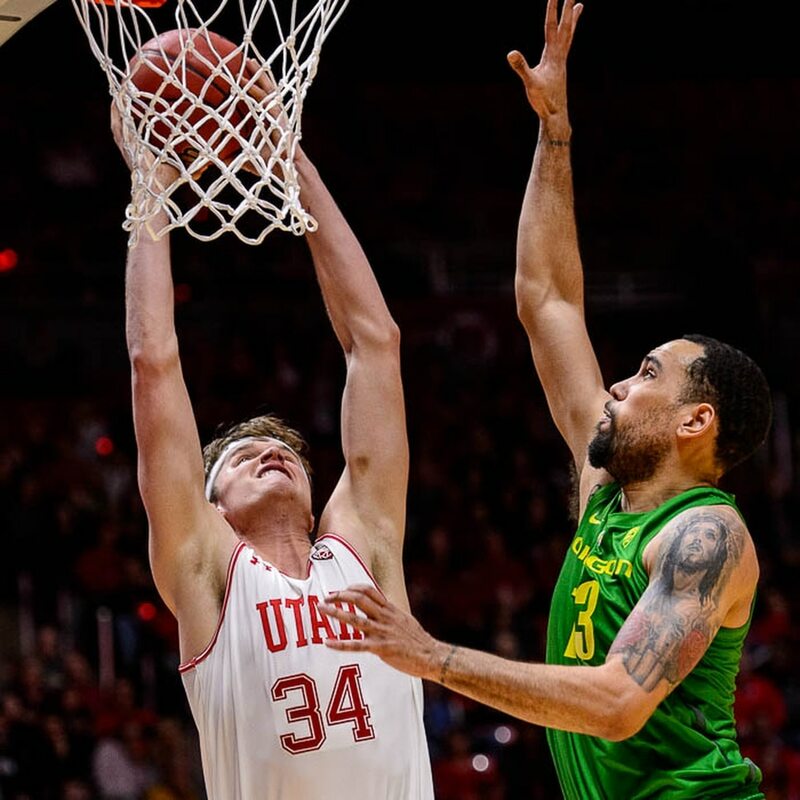 Poor passes and other turnovers of all varieties doomed Utah to a 78-72 loss to Oregon on Thursday night at the Huntsman Center. The Utes wanted to honor the program's proud history by wearing old-style uniforms, but their performance over the last 26 minutes of this game didn't do much for the past, present or future of Utah basketball. Oregon's aggressive, full-court press caused all kinds of trouble near the end of the first half, when the Utes lost all of the 14-point lead they had built with excellent defense and 3-point shooting. Eight of Utah's 19 turnovers came during the team's last 14 possessions of the half, when Oregon stormed ahead 38-34 with a 22-4 closing run. Utah coach Larry Krystkowiak's accurate summary of the game included “the best of how we can play and the worst of how we can play.” The problem was the bad stuff overwhelmed the good parts, as the Utes (11-9, 5-3 Pac-12) fell from solo second place in the conference to a four-way tie for third. The natural conclusion is Utah's four-game winning streak was misleading, built against the Nos. 9-12 teams in the league. The scheduling upgrade to Oregon spoiled everything, once the Ducks started making baskets and cranking up their press. How’d that work out? When the Ducks used only a mild, zone look in the backcourt, the Utes thrived. But when Oregon (13-8, 4-4) switched to a man-to-man scheme, Utah couldn’t even manage to inbound the ball successfully from the baseline at times. Utah had a 35-32 rebounding edge, but the Ducks converted offensive boards into key baskets during their decisive run. And the Utes clearly are a front-running team, emotionally and schematically. When they're getting stops and moving quickly into the frontcourt, they thrive offensively. If not, as also happened at home against league-leading Washington three weeks ago, things tend to crumble in a hurry. Donnie Tillman and Barefield led the Utes with 16 points each, although Barefield often tried to do too much on his own and shot 4 of 16 from the field. Jayce Johnson posted 11 points and a season-high 13 rebounds in 23 minutes, but he went 1 of 6 from the free-throw line. Freshman guard Will Richardson scored 19 points for the Ducks, who led by 14 points until Utah made a mild rally at the end. The Utes made only one field goal in a 12-minute stretch spanning halftime. They attempted only three shots in the key stretch of the first half, while their eight turnovers stemmed mostly from panicked passing, amid back-court, shot-clock and 10-second violations. 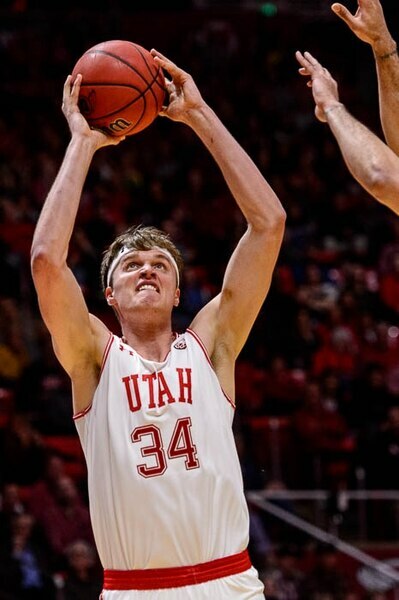 The Utes had displayed poise and 3-point shooting ability in building their lead, but everything crumbled when Timmy Allen and Tillman got into foul trouble. Krystkowiak had prepared for Oregon's scheme by using four offensive players against five defenders in practice. Even with a full team on the court, though, the Utes had all kinds of trouble. Even when they held onto the ball, the Utes' struggles continued. In a 19-minute stretch, Utah scored 17 points. The effect of the press is “it really kind of creeps into your whole offensive scheme,” affecting the team's rhythm, Krystkowiak said. Just like that, Utah’s winning streak ended. Oregon State comes to town Saturday. Regrouping is required, and right away, before the Utes sink further in the bunched-up Pac-12 standings.